Proactive natural proteins which suppress appetite. 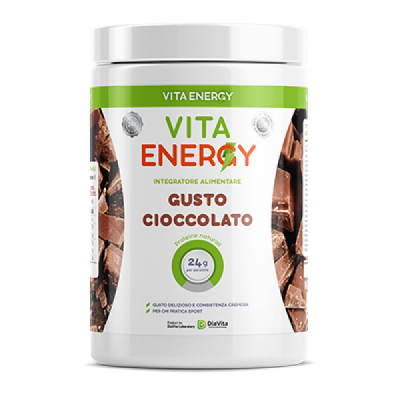 Vita Energy 74% protein formula contains 74 g protein in 100 g of product. It will help to maximize your workout results. Ingredients: Whey Protein Matrix [89% Whey Protein Concentrate, 5% Whey Protein Isolate, 6% Hydrolyzed Whey Peptides], skimmed cocoa powder, Vegetable oils [Vegetable Medium Chain triglycerides (MCT) from coconut oil], Emulsifier (Sodium carboxymethyl cellulose), flavourings, Sweetener (sucralose). Allergen information: People with individual intolerance to the components of the product should consume it cautiously. Not recommended if you are lactose intolerant. Made in a facility that processes eggs and nuts. Storage conditions: Store the jar with lid tightly closed at 5-30°C (41-86°F). Keep away from direct heat, moisture and sunlight. Do not store for more than 6 months after opening.